Friday night after work I took the train up to Chicago to visit some friends from high school. I figured I should come up and do something different, as the weekends that I have left to enjoy in the US are becoming very few indeed. The train ride itself was relaxing. I wish people would support Amtrak(wiki) so that it doesn't go out of business. It is definitely a leisurely way to get someplace, the frequent and unpredictable delays mean that one needs to be very flexible about what time they arrive. 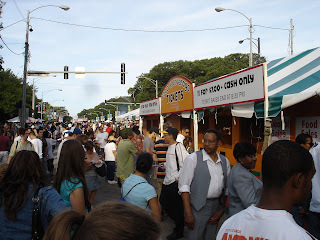 Lucky for me I came to town when the Taste of Chicago(website) is running. Eating weird food that I've never had before is one of my favorite things, and this festival more than satisfied the quest for exotic munchies. The setup was pretty typical as far as these things go. They used a ticket system, which unfortunately masks the cost of everything, but makes the lines a lot less painful. The only downside to this was the enormous amount of people who decided to attend at the same time as me. In the worst areas, just walking across the street took real determination and planning. Not only that, but everyone is carrying various messy foodstuffs, which means that bumping into someone could quickly change the color of your clothes. A ticket booth at the taste. I ate all kinds of stuff. The first was at a tent which featured African food. 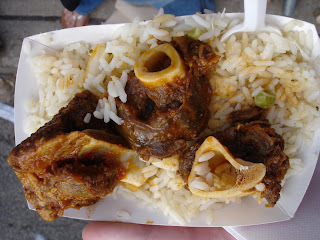 I had goat meat with coconut rice. The meat was still on chunks of the bone. A little bit chewy, but satisfying. The next thing I just had to try despite what common sense would dictate. Turtle soup. I've heard it said threateningly in so many episodes of Teenage Mutant Ninja Turtles(wikipage) that I couldn't turn it down. I should have. First of all, there was no turtle meat in it, which was disappointing. The soup consisted of broth only, and what a weird broth it was. Colored a dark, swirly yellow, the soup had a bad smell and a sour taste. I didn't even want to finish it.. bleh. Shredder should've threatened to make the ninjas EAT turtle soup, could be more scary than becoming it. That's the risk in trying weird stuff I guess... but its a risk worth taking.